Why I Read It: I've seen several reviews, many of them really positive, but it was this one from Georgia at Books and Writers JNR - "I was giggling like a maniac for the most part, literally from the first page." - that convinced me to read it. Ben Fletcher is a pleasant and fairly quiet boy - so when the 17-year-old gets roped into taking part in the Great Trolley Robbery to grab some booze for a party, it's just his luck that he's the one who ends up getting assaulted by a lollipop lady and put on probation! Forced to keep a journal, give back to the victim of his crime, and take up an approved hobby, he reluctantly chooses knitting - only to find a real talent for it. 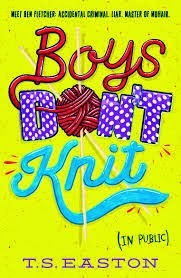 Can he keep his new-found hobby a secret from his dad and his mates, get the girl of his dreams, and become a champion knitter? I'd read a few reviews which said this was really funny, but these were clearly massive understatements. This is absolutely hilarious - thanks partly to the stunning voice of narrator Ben, and partly to the outstanding cast of characters. Everyone here - Ben himself, his parents, his school friends and the bullies who pick on them, the girl he fancies, the teachers, the old lady he helps as part of his probation, the rest of his knitting group, and so many more - are vividly realised and brilliant to read about. Perhaps even better are the relationships between them. Ben's home life isn't quite ideal - his parents constantly gross him out with double entendres and his mum is a stage musician who spends a fair bit of time on the road, while his dad is obsessed with things that Ben has no interest in and thinks Ben should be keener on football and cars. Despite this, the love his family has for each other shines through their issues and similarly, while his mates wind him up and get him into trouble, when it comes down to it they're really supportive. Ben is the stand-out, though. He's a fabulous narrator who it's very easy to sympathise with - especially when he gets roped into fiascos like the Great Trolley Robbery! Huge recommendation as a wonderful comedy. I can't wait for the sequel, An English Boy In New York! Why I Read It: A week or two ago I had a TBR list which was nearly long enough to form a book itself. 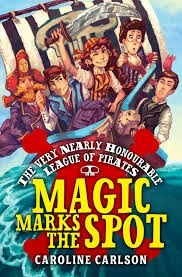 Then I read a review of Magic Marks The Spot on Nayuleska's blog, where it got her coveted 10E (That's E for Epic) rating. On the same day, I saw a 5-star review from Linda Lawlor, one of The Bookbag's best reviewers of children's books. Both Linda and Nayu have fairly similar tastes to me, so I decided anything which they both gave full marks to had to be worth trying. Hilary is delighted to be accepted into the Very Nearly Honourable League of Pirates - but devastated when they realise she's a girl and respond by sending her application on to Miss Pimm's Finishing School. Apparently the only thing that the League and her father Admiral Westfield agree on it's that the high seas are no place for a young lady. Hilary, though, has other ideas, and runs away from school. With a misfit crew and a gargoyle as a companion, can she find the kingdom's lost magic and prove herself a buccaneer? The documents scattered throughout the book really add to it, as well (although my only minor gripe is the print size for them!) The forms filled in by the pirates when they go out sailing, the letters exchanged between characters, and guides such as Treasure Hunting For Beginners are all brilliant. There's also a fantastic ending which is satisfying in its own right and joins the next books from Tom Easton and Candy Harper at the top of my most wanted list. Oh, and the illustrations - both the interior ones and that AMAZING cover - are beautiful. Hugely recommended! Why I Read It: Trying to read more MG and it looked interesting. 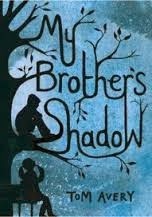 Extremely moving story about a young girl grieving after her older brother's death is very well-written, while Kate Grove's superb illustrations really add to Avery's text. Full review at The Bookbag.